Contact lenses can be a great addition to your eyewear. During your exam we will discuss your lifestyle and which type of contact lens would give you the best experience in both vision and comfort. 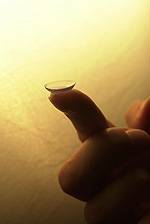 In many prescriptions, contact lenses are available in two week, one month, and one day replacements. Call today to schedule your contact lens evaluation, or make it part of your annual exam. Top Contact Lenses We Recommend. Our optometrist takes the time to explain the results of your eye exam, describe your options and listen to your eye care needs. We accept most insurance plans. If your vision insurance type is not shown below, it is possible that we will be able to provide out-of-network benefits for you. For medical visits, we are also able to submit to major medical companies. Alcon’s Dailies Total 1, 1-DAY ACUVUE MOIST and ACUVUE OASYS for ASTIGMATISM contact lenses are our top sellers.